When a celebrity dies, the feeling of loss we experience isn’t always rational. Gene Hackman is still alive, for example, but unless you know him personally, or enjoy reading his novels, he might as well have passed away a decade ago, when he retired from acting. Nonetheless, I’ll feel sad when he’s no longer around, and it won’t have much to do with any meager hope I currently possess that he might appear on screen again. (He’s consistently stated this is not going to happen.) By the same token, Alan Rickman’s unexpected passing last week hit me hard, even though I hadn’t been excited about anything he’d done since Galaxy Quest. I never really gave a damn about Harry Potter, and the last three films I saw him in—Gambit, Lee Daniels’ The Butler, and CBGB—were varying degrees of dismal, his own performances included. Everything I treasured about Rickman was as accessible to me as it had been the day before. Yet I still felt as if something had been taken away from me, and I desperately wanted it back. This clip immediately follows the magnificently staged scene in which Jamie (Rickman) first reappears to Nina (Juliet Stevenson), which I would have included here if not for time/fair-use concerns. Her initial reaction to his presence is as violently emotional as it would likely be in real life, and Minghella quickly jumps forward to a bit later, when Nina has managed to get some semblance of a grip again. Nonetheless, Stevenson—whose work throughout Truly, Madly, Deeply is astonishing—never loses sight of how bizarre this situation is. She prods Jamie’s body to reassure herself that she isn’t imagining him. When she heads out to lock the back door (which turns into bringing in the laundry), she hasn’t taken more than two steps before she looks back to see if he’s still there, and squeals with glee when she sees that he is. Even when he steps out onto the back porch a moment later, Nina visibly giggles to herself slightly, as if she’s ecstatic to see him all over again. And all of these gestures give additional weight to Jamie’s simple statement: “Thank you for missing me.” The film has spent about half an hour establishing how much Nina had missed him by this point, but there’s something deeply poignant, all the same, about this semi-formal exchange. It also triggers a story that Jamie wants to tell, about a little girl named Alice he knows in whatever place or dimension he’d inhabited before returning. (This scene also includes the movie’s only exposition on that subject, which Minghella expertly sidesteps, because it doesn’t matter. 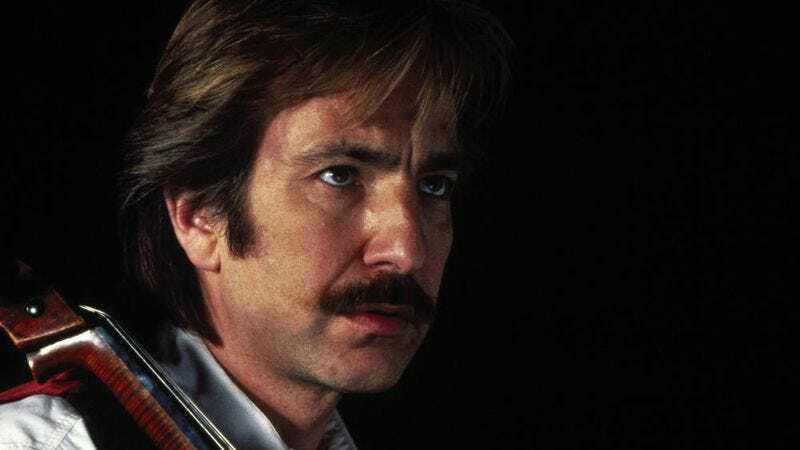 There’s perhaps no more satisfying answer to the question “Do you go to heaven, or what?” than a lightly amused “I don’t think so.”) Rickman, who was almost exclusively known to moviegoers as Die Hard’s evil Hans Gruber at the time, demonstrates in this monologue just how much tenderness his sonorous voice can generate. And this time, it dawned on me that the reactions of the living children’s parents—who probably never met Alice, and know about her death only from the plaques in the park—echoes my own reaction to the loss of someone like Rickman. Even if he’d never given another performance that meant as much to me as this one does, he serves as a sort of avatar for the people in my life whose absence would crush me. That’s almost certainly why James Gandolfini’s death upset me more than most: While I admired his work, he also reminds me a little of my dad, another large Italian guy. Celebrities, who occupy a strange middle ground between people we don’t know at all (whose deaths are mere statistics) and people we know intimately, are a sobering reminder of what could befall us at any moment, and of how lucky we are. Of course, there’s more than one ghost associated with this scene now. As beautifully as Rickman delivers the speech about Alice, it was Minghella who thought it up; his sudden death in 2008, at age 54, deprived the world of numerous potentially terrific films. His final feature, Breaking And Entering (2006), was overly ambitious and somewhat maudlin, but it was also his first wholly original screenplay since this one (though I do love his adaptation of The Talented Mr. Ripley), and it demonstrated again—as do his early stage plays—how incisive he can be when it comes to the travails of long-term relationships. While this scene is primarily about Nina’s astonishment and giddiness, and then about Jamie’s gratitude, Minghella also immediately begins sewing the seeds of Jamie’s hidden agenda. I don’t want to say too much about where the story goes, lest that diminish the experience of folks who haven’t yet seen the film. Suffice it to say that Rickman was ideally cast on multiple levels, including the faint touch of haughty superciliousness that emerges when he complains about Nina’s crummy, cold flat and chides her for having “red bills” (which I gather from context refers in England to second notices sent when a payment is overdue). Because Minghella remained behind the camera, I don’t feel the same illusion of knowing him that I do with actors, but it was still bittersweet to realize anew that the agile mind behind this film no longer exists. In the end, though, revisiting Truly, Madly, Deeply on the day Rickman died achieved what I’d hoped. Jamie is a structuring absence for over 30 minutes, seen only in photos (plus a flashback of him playing the cello in the opening-credits sequence) but referred to constantly. His subsequent reappearance takes on a metatextual force, and Nina functions as a stand-in for the viewer who feels the world is a lesser place without Rickman (and so many others) in it. “Thank you for missing me,” he says. We do. We will.